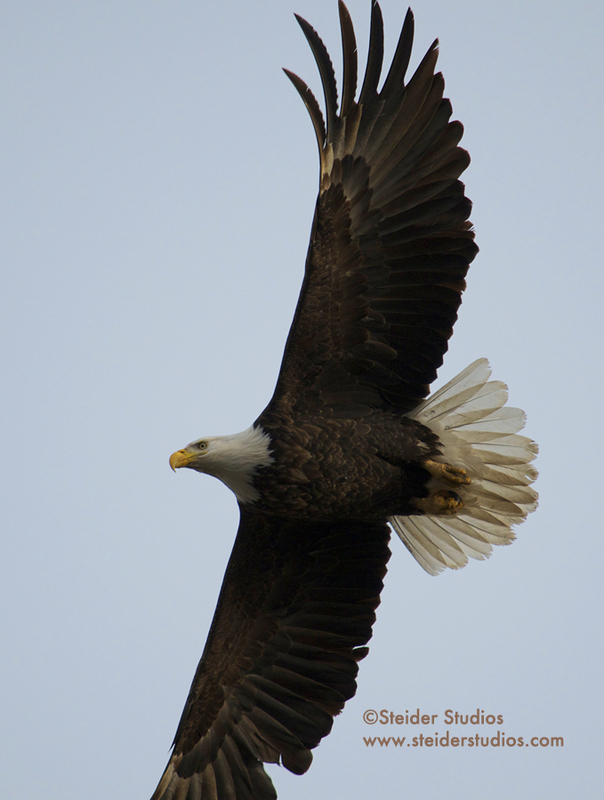 January was an incredible month for chasing eagles. 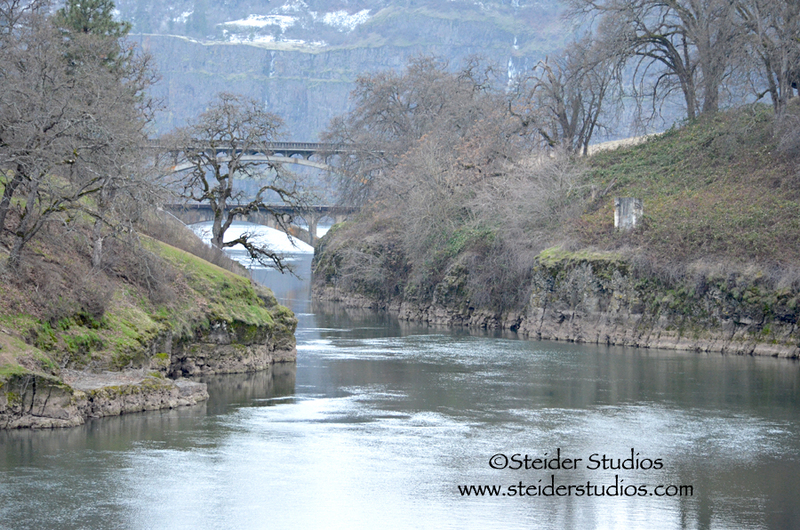 I’ve been down by the river all month in spite of below freezing temperatures. 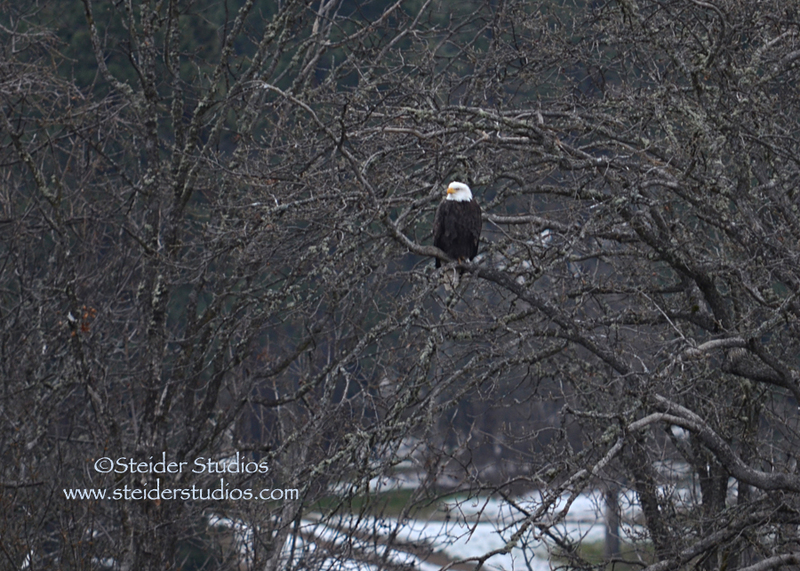 The best day was January 27th when my friend Nancy and I counted FORTY SIX eagles between Major Creek, Balfour Park, The Dalles Dam, Meyer Park and Mosier. Simply stated, it was a magical day. Thousands of photos later, I’ve whittled down my image catalog to those I can’t bear to part with. 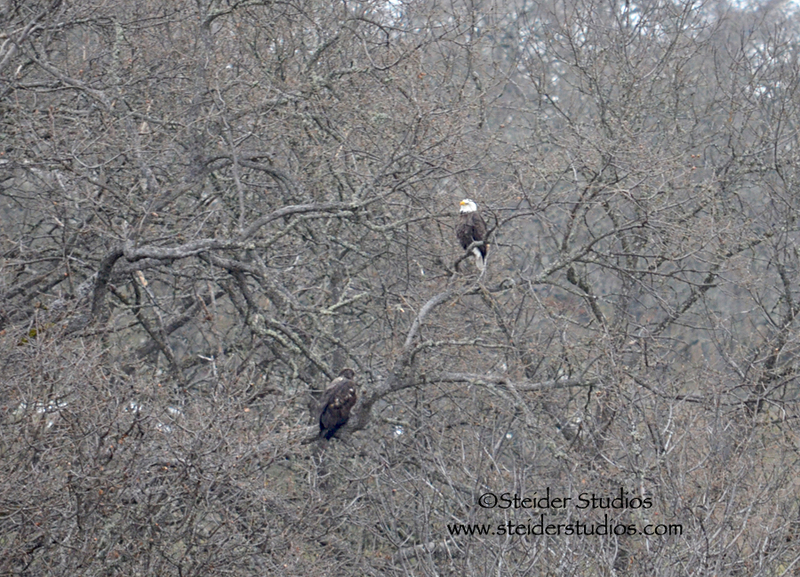 Not all are that great, but remind me of what I saw, staring up in wonder at the magnificent Bald eagles. 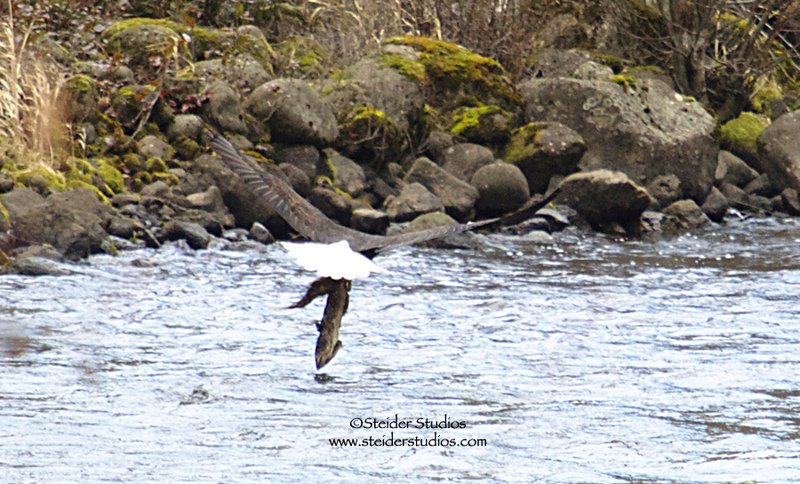 On the Klickitat River I caught an adult bald eagle taking his fish to a more private dining area. 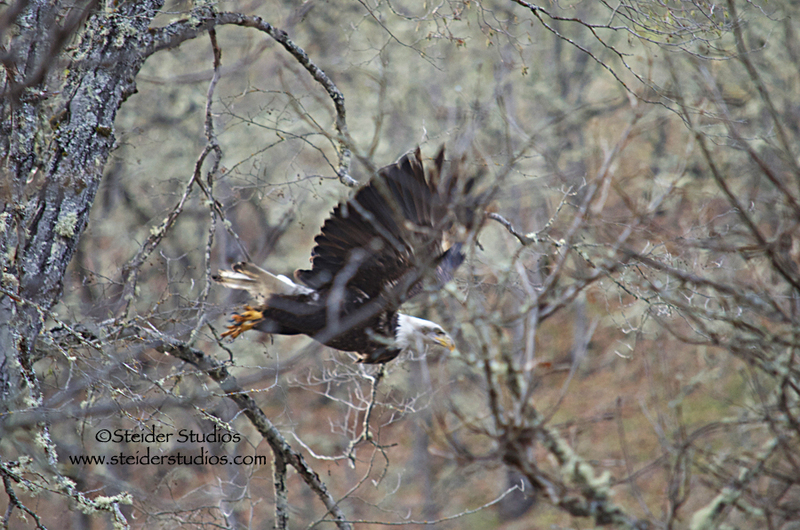 Further up the Klickitat River eagles were harder to photograph due to camouflage of twigs and branches. While we wait for photo opportunities the surrounding landscapes are breath-taking. 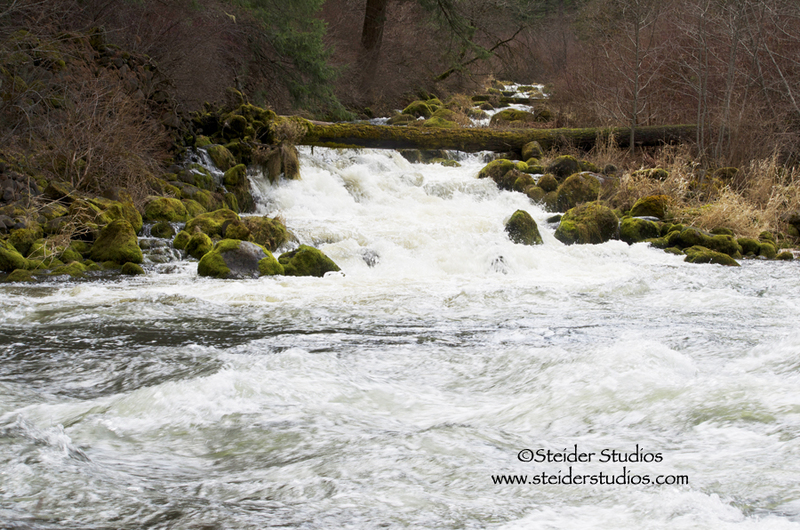 This is an upper section of the Klickitat River on a frigid January morning. I can still hear it roar. 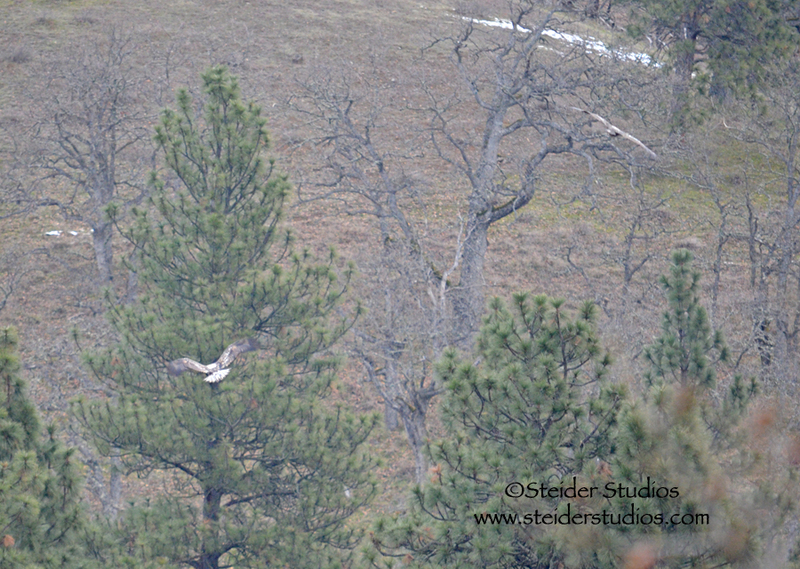 My heart soars with these magnificent birds. Am I lucky? Blessed? In the right place at the right time? Yes. 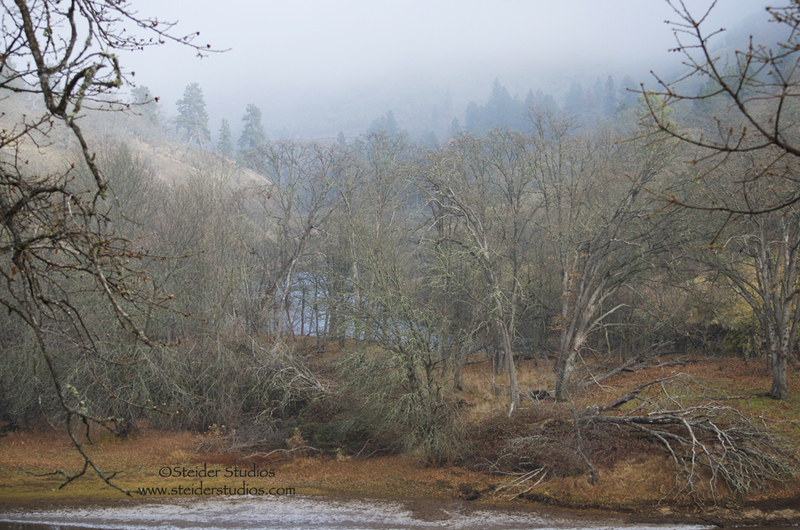 This is Balfour Park where eagles perch in trees along the Klickitat River. 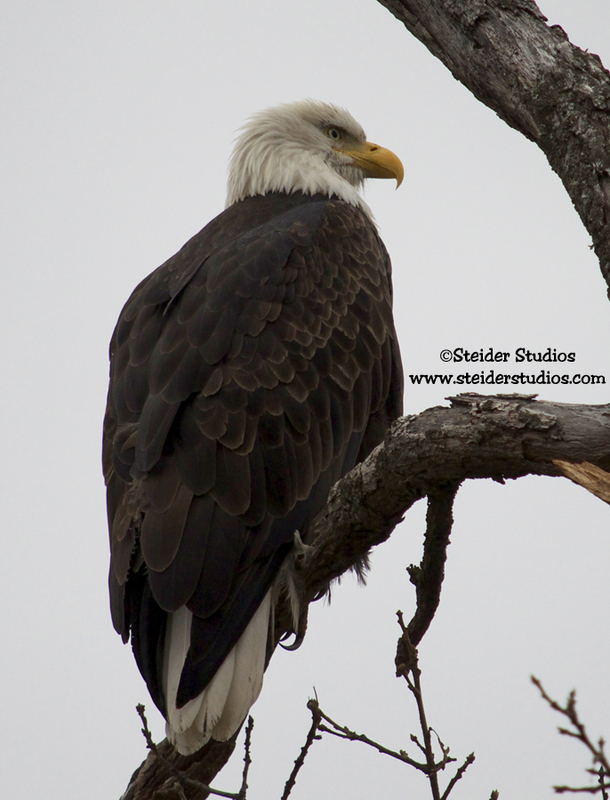 I’m still waiting for my new Tamron 150-600mm lens that will allow me to get much closer to these incredible birds. This adult bald eagle perched right on the paved path at Balfour where numerous visitors including Yours Truly were able to photograph him endlessly. 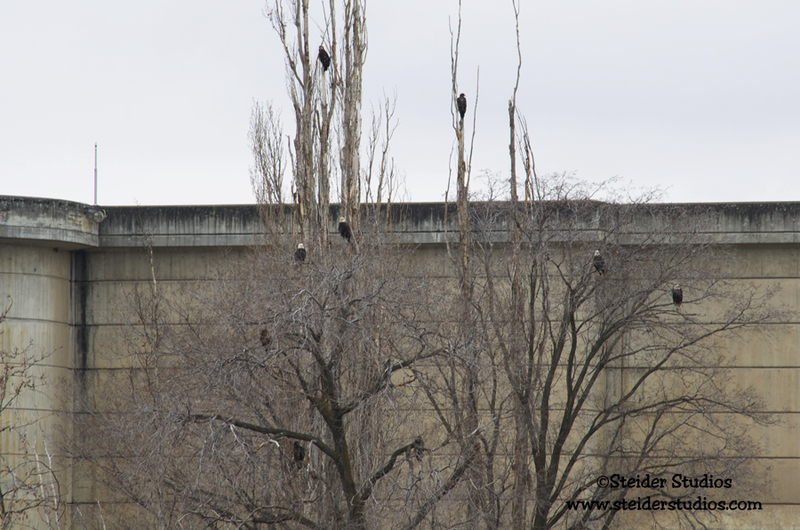 At the Dalles Dam on the Columbia River dozens of bald eagles congregate daily. I will get much better shots of them with my new lens. If it arrives before the eagles leave! 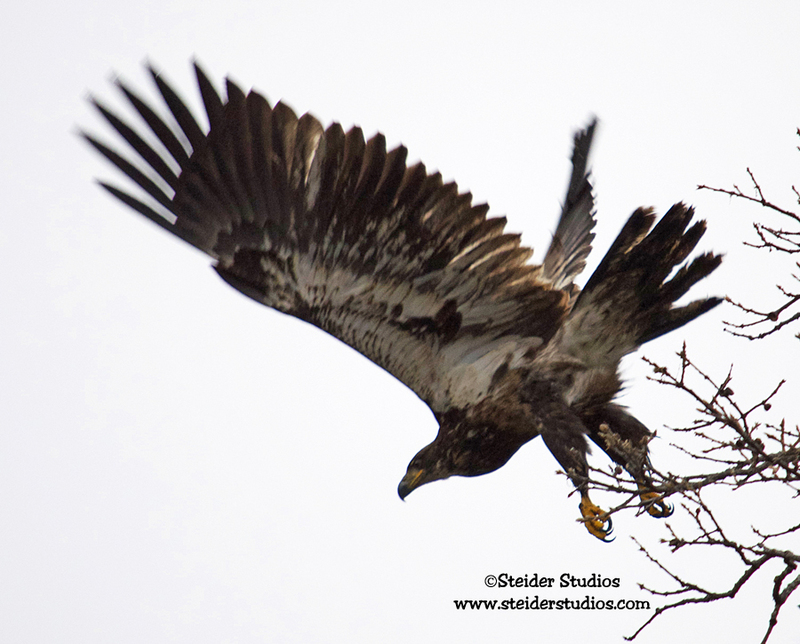 A juvenile bald eagle surprised me when he took off directly overhead at Major Creek. I think I surprised him too! 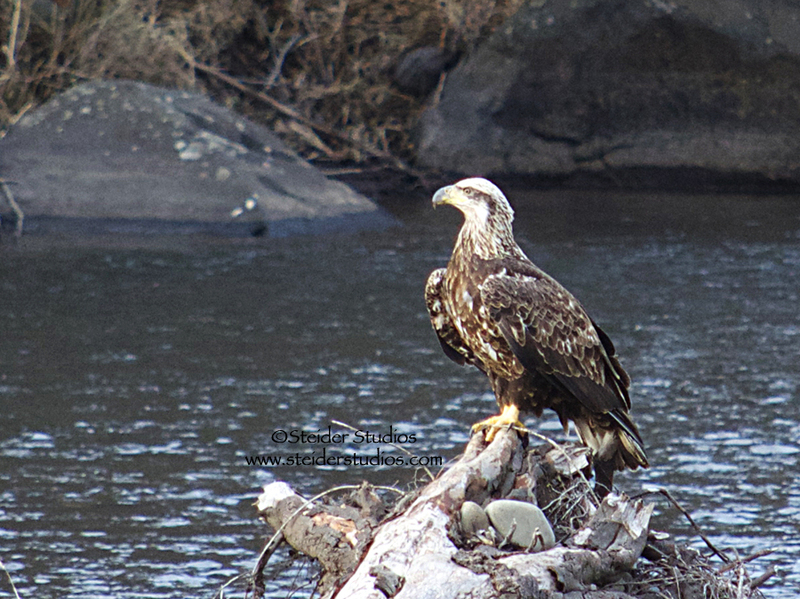 Although not sharp, I like this photo because of the white feathers on his back and his tail feathers have brown tips. Near Lyle Point along Highway 14. 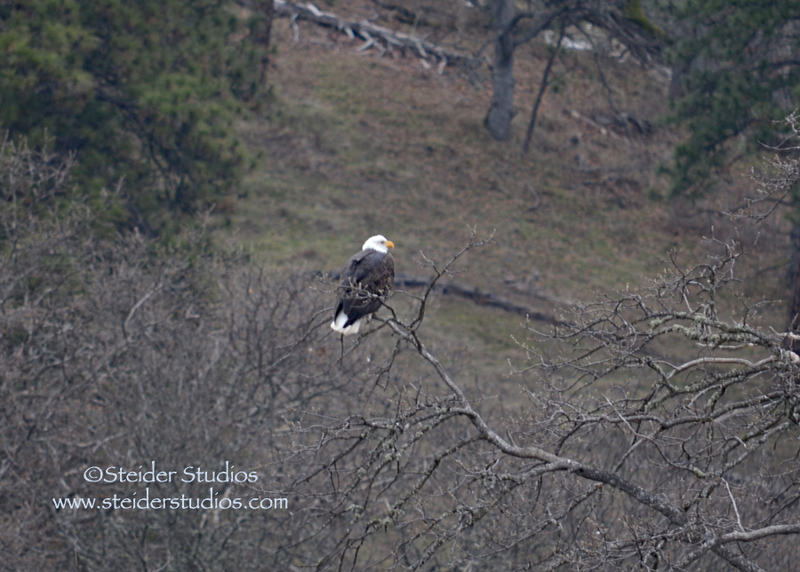 Mosier Creek where it flows into the Columbia River is another great spot for watching eagles. Many of my images have been printed on all occasion greeting cards and are available in my Zibbet shop and my ArtFire shop; and are also available as metal prints and canvas wraps to adorn your home or office walls. If you see something you like and it’s not in my shops, please send me a message to make it happen! Happy New Year! I look forward to sharing new adventures with you, starting with today’s! 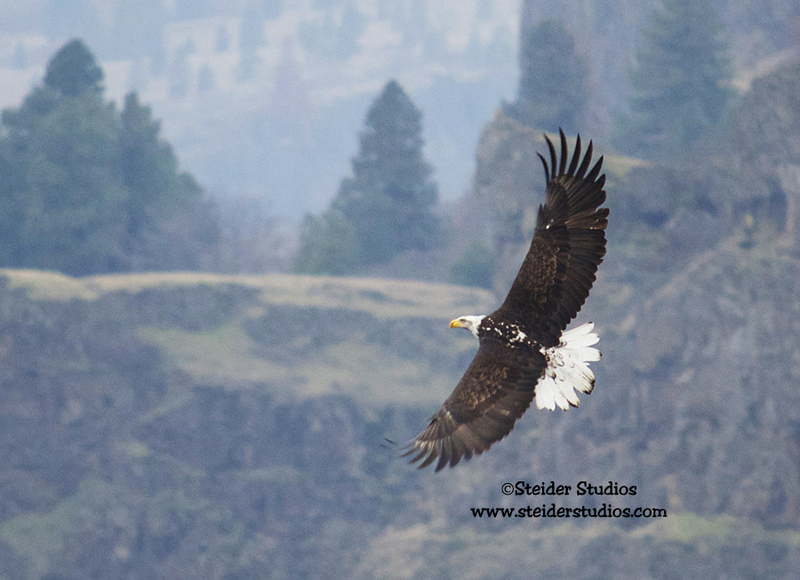 My glassy girlfriends and I planned a hike up the Klickitat River in search of Bald Eagles. 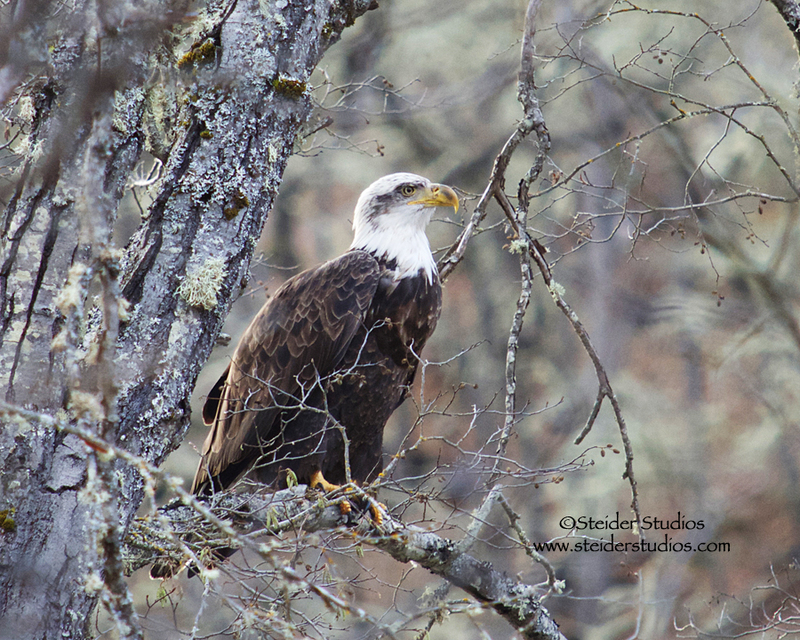 This time of year they’re abundant along the Columbia River and it’s tributaries. 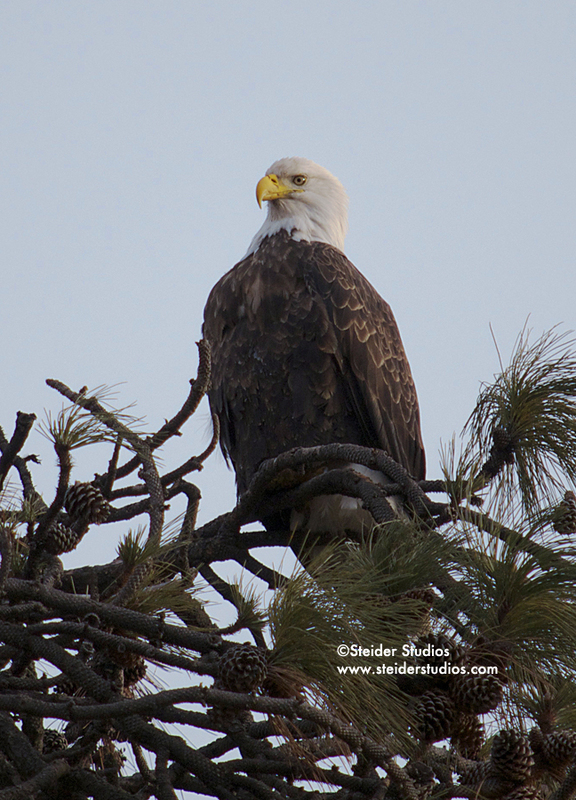 At dark thirty an eagle’s white head absolutely glows. 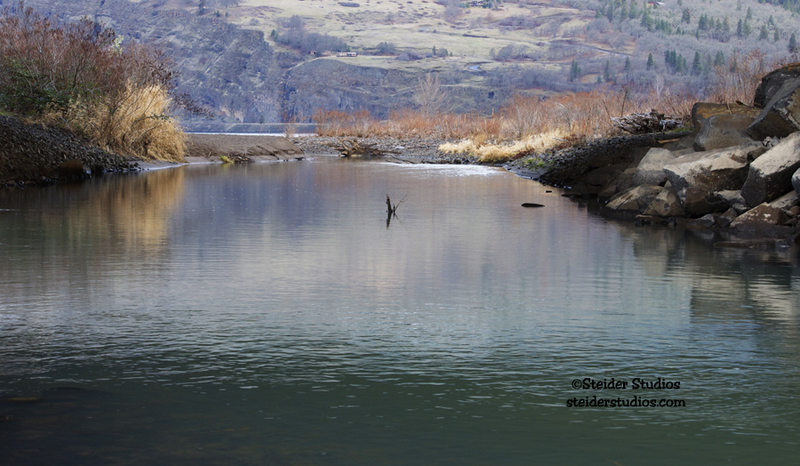 We had the entire Klickitat River to ourselves – just me and my dog. My friends bailed on me last night, but I can’t blame them – one was sick & the other was expecting a studio visitor today. It was 22 degrees when I left at 7 a.m., 32 degrees when I arrived at the parking lot, but a balmy 40 down by the river! I hiked down to a sandy beach along the Klickitat River near the Confluence of the Columbia River to get as close as I could to the birds. I am always inspired and invigorated when this close to nature and wildlife. Even if it IS freezing outside! 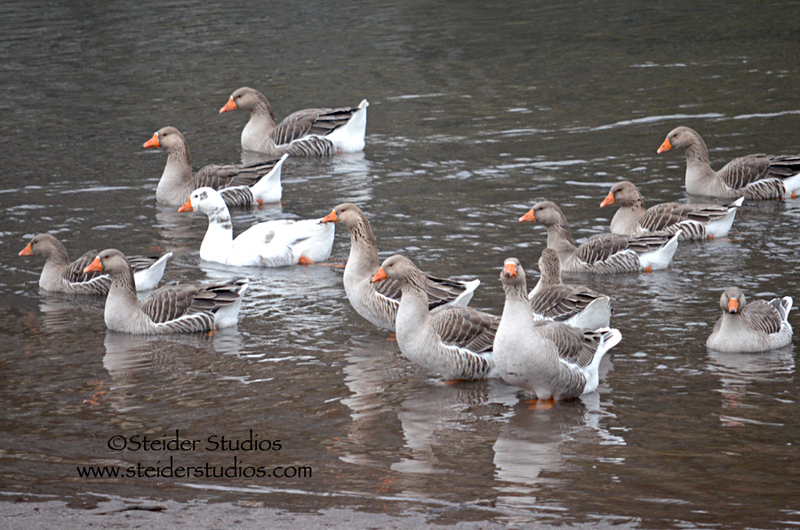 There were plenty of geese on the Klickitat River while I (im)patiently waited for bald eagles to become active. They were understandably nervous about my dog being so close to them. 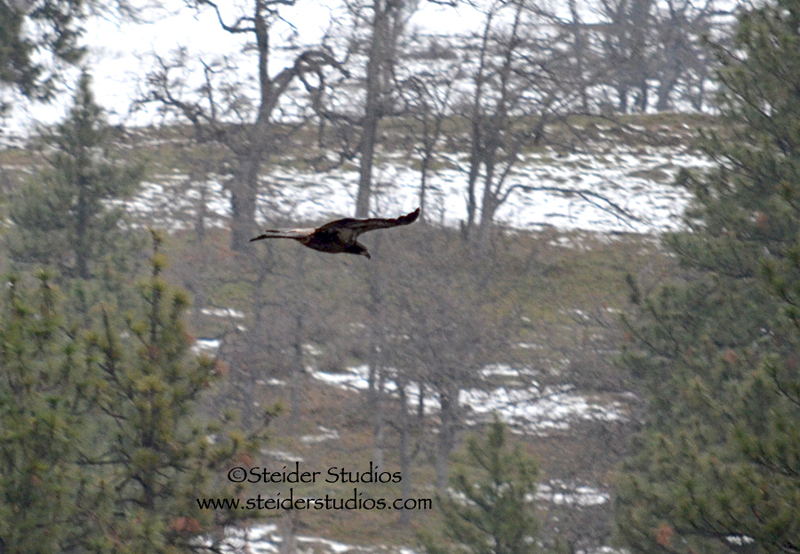 A youthful bald eagle was the first to let me practice my ‘in flight’ photography. He landed with grace and I managed to get 150 blurry photos of his skill. 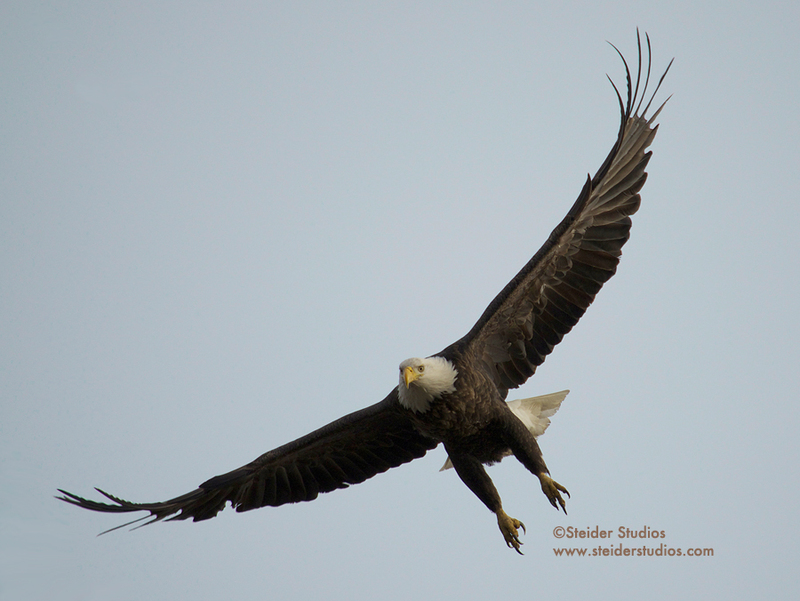 A second youth showed up right on his heels as I continued to snap away, getting as many practice shots of eagles in flight as I could. 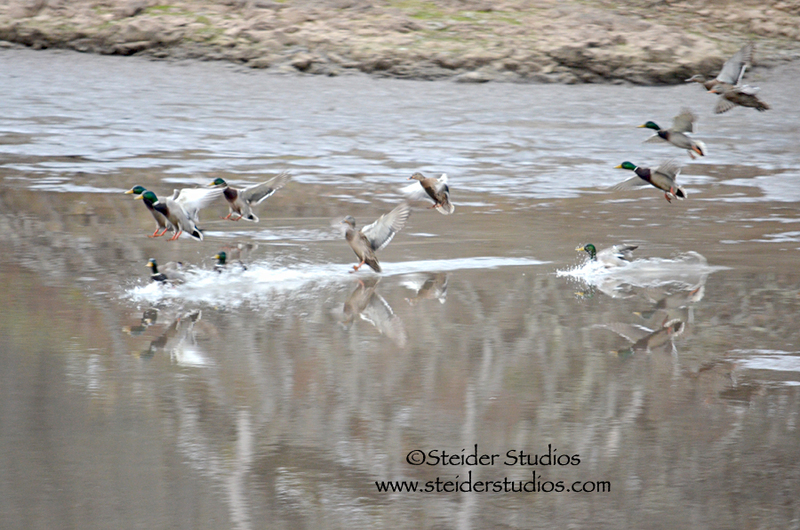 I think these ducks decided to take cover from the flurry of young eagles flying about. 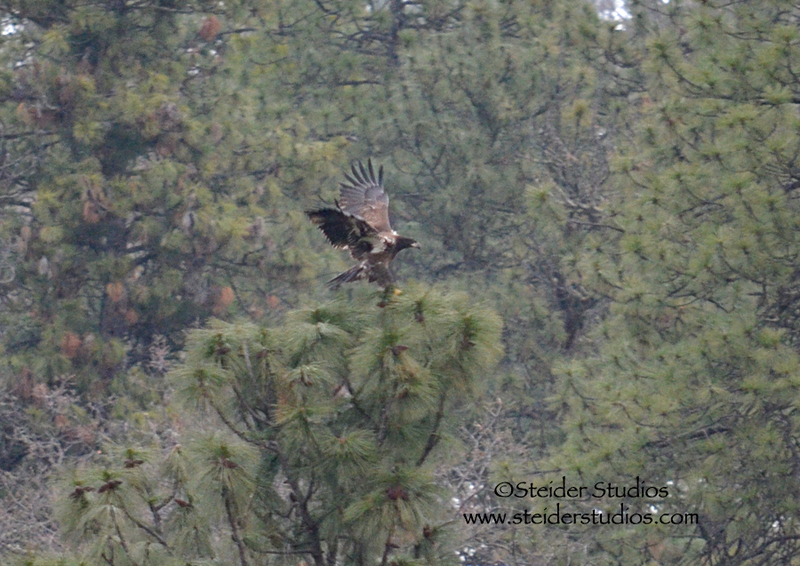 A third young eagle flew over shortly after the first two. 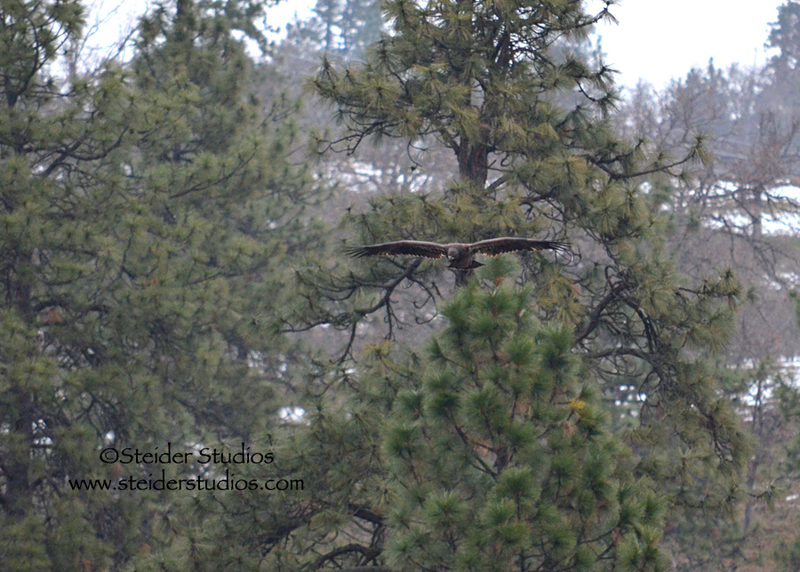 This adult bald eagle flew in from the upper part of the Klickitat River and joined the five that I’d been watching. In the meantime, my new friends decided my dog wasn’t coming to the river’s edge after all. 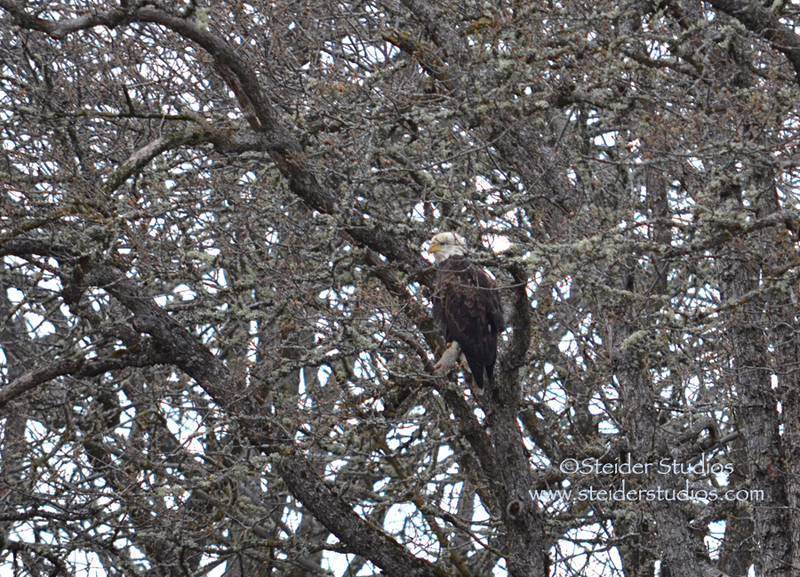 I counted six adults and three young bald eagles this morning plus sighted one along the highway on my way home. Oh! 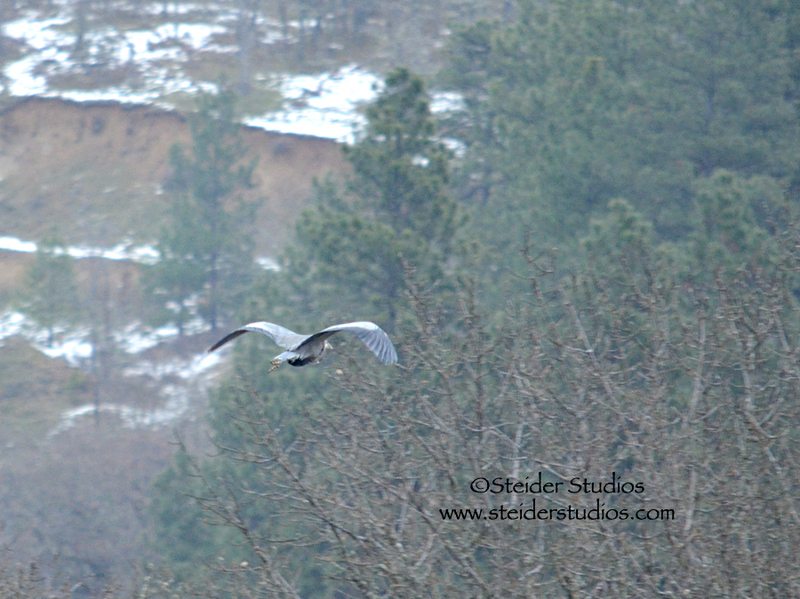 Two herons burst out of one small creek and headed north along the river – they were thrilling to watch and I’m happy I caught one with my camera! 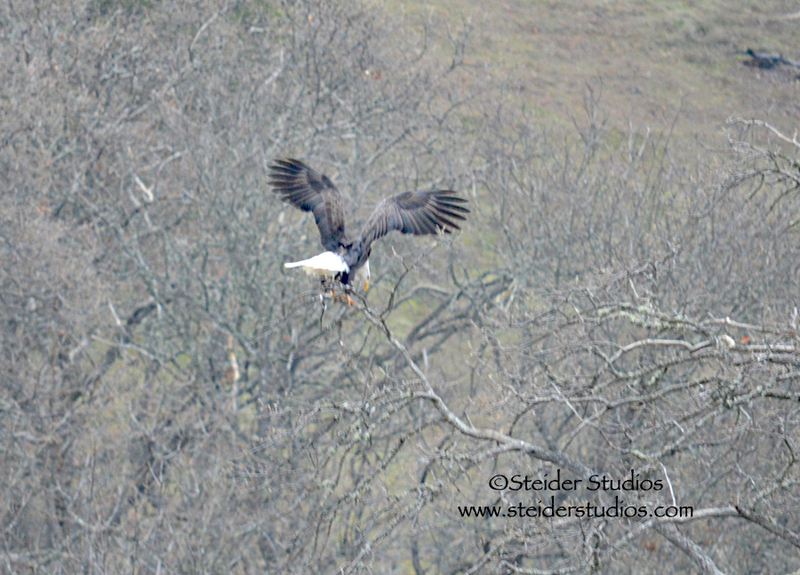 The young eagles put on a great show for me. They seemed more active at 9 than they were at 8. Think I’ll plan my next trip accordingly. 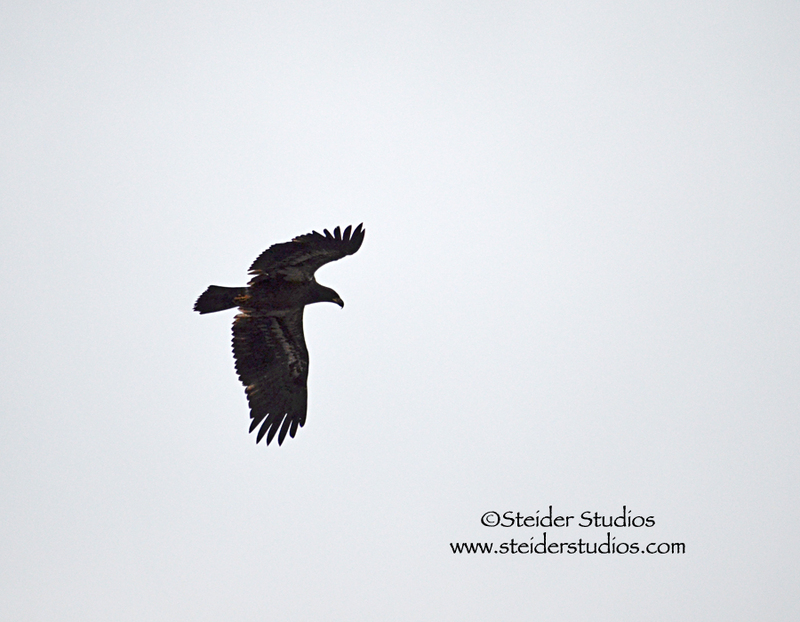 It was hard to get a clear picture as they flew overhead against the gray sky. Most of my overhead shots are just silhouettes. 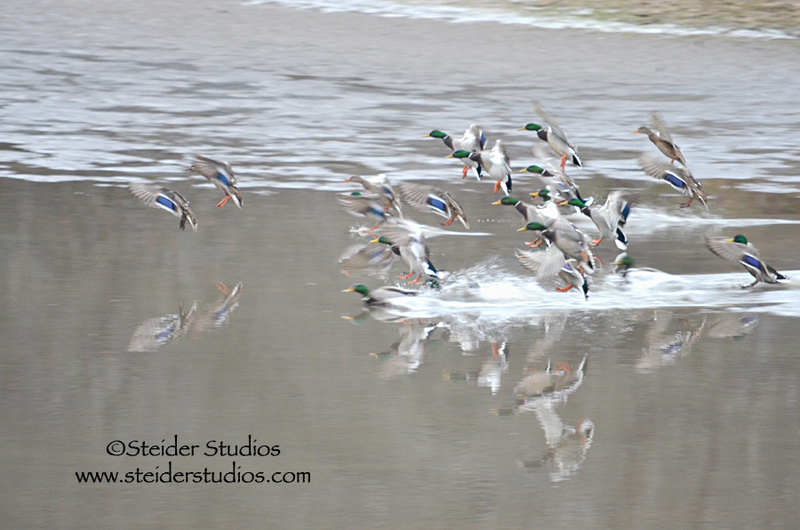 I don’t know why I like this shot of the ducks landing, but it’s so full of color against the gray water that I decided to include it for you. 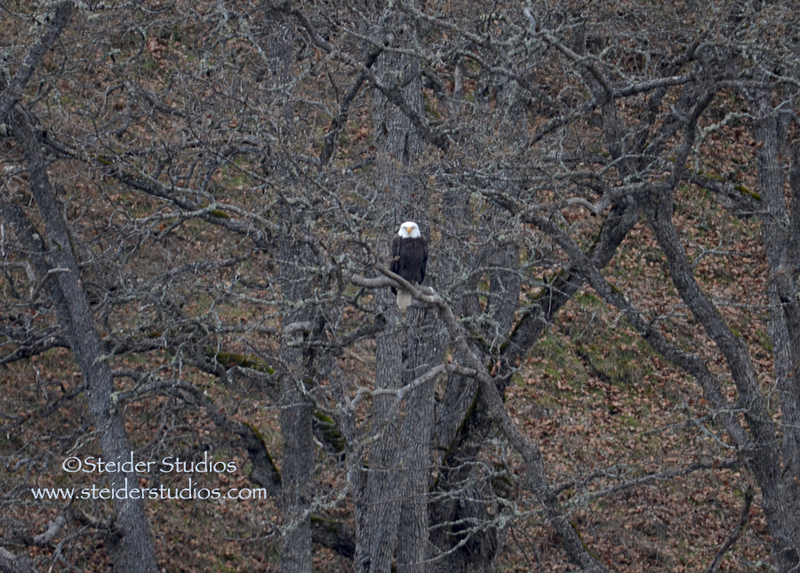 This was about the closest I could get to the eagles in the trees along the river. I need a longer lens! I hadn’t wanted to carry it, but next time I’ll pack along my tripod. After about an hour and a half I was frozen in spite of three layers of clothing. We’re expecting freezing rain this afternoon, so I’ll stay snug in my studio for the next few days gearing up for shows and photographing the hundreds of earrings I made the last few months. The Glass Craft & Bead Expo is just around the corner. I hope you can take a class with me this year! I’ll post more info soon! 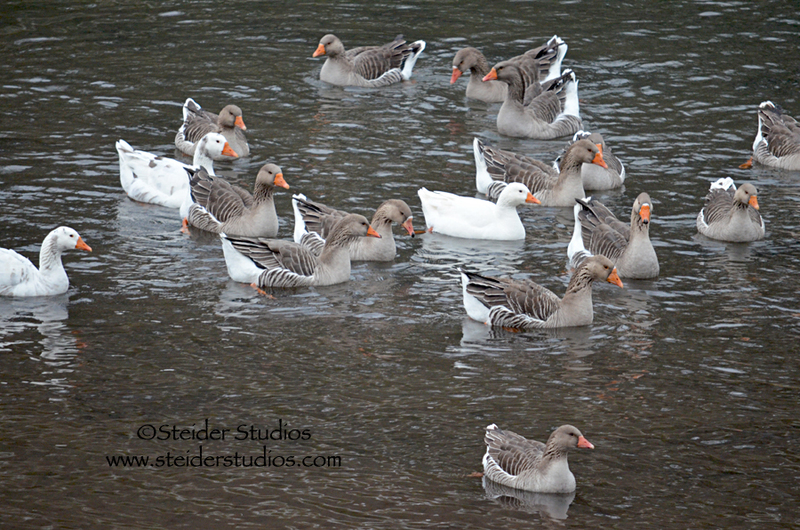 You can see many of my photographs published as all occasion greeting cards in my Zibbet shop. Just click this link.